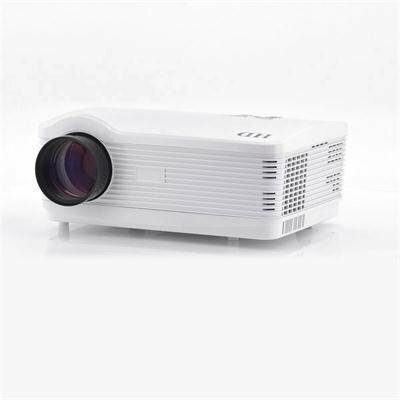 Successfully Added Dual Core 1.5GHz CPU Android 4.2 Projector "DroidBeam" - 8GB Internal Memory, 3000 Lumens, 2000:1, WiFi (White) to your Shopping Cart. Android 4.2 HD Projector with 3000 Lumens, 2000:1 contrast as well as an impressive 1.5GHz Dual Core CPU, WiFi and 8GB of Internal Memory ensures this is a top of the line home theater. This powerful and exciting projector that is known as the “Droidbeam” is a High Definition Android Video Projector, which enables you to watch movies in the comfort of your home in spectacular 250 inch HD cinema format. The “Droidbeam” has Android 4.2 Jelly Bean operating system pre-installed so that you can also join and experience Google Android and all the features it has to offer. With Android 4.2, you’ll have access to the wealthy Google Play store and you’ll be able to download and install any of the 700,000 plus apps directly onto the “DroidBeam”. Powering this HD projector is a 1.5GHz Dual Core CPU and 1GB RAM, watching 1080p Netflix, Skyping with your friends and playing any Android game will not encounter a problem or lagging. A huge advantage of the “DroidBeam” Android LED Projector is the cutting-edge LED technology that has 3000 Lumens and the lamp life is about 50,000 hours. In addition, the LED light source consumes less energy than traditional lamp-based projectors and is mercury free, making this projector an eco-friendly and wholesale solution. The “DroidBeam” comes with a built-in Wi-Fi receiver therefore you can wirelessly surf the web, download content and more. For saving all your files, games and media, there is a huge 8GB of internal memory that will be more than enough for saving. If the 8GB of internal memory starts to get full and you can insert an SD card into the built-in SD card slot for additional memory of up to 32GB. Last but not least, a whole array of ports, such as 2 HDMI ports, 2 USB ports, 1 VGA ports and many more let you connect every possible device to the beamer for larger than life projection. These ports prove useful for connecting wireless mouse and keyboards as well as other accessories that are compatible, making your projector become a very diverse tool. Transform your front room or office into an Android 4.2 projecting power home theater with the “DroidBeam”. This product is in stock and can be dispatched within 24 hours of ordering with a 12 month warranty. Brought to you by the leaders in wholesale electronics and cheap projectors, Chinavasion. I got this DroidBeam a few weeks ago. Before delivery, I did contact Chinavasion with the chat they have on their website and the guy was very helpful. I received the product in Israel a week after I ordered it. DHL collected from me the customs fees and delivered it to me without any problems. I did install it hanging from the ceiling and I turned the image upside-down. My Electric Projection Screen is also hanging from the ceiling and it is 2 meters wide. In order to see all the picture on the screen without projecting part of the picture on the wall behind I had to reduce the picture to 75% (this is the minimum in this projector) and install the projector not more than 4 meters from the projection screen, otherwise, the picture would have been too big for my projection screen. I did connect the projector to a pc and to cable TV with one HDMI cable through my Onkyo 626 receiver. The projector works perfectly as described on Chinavasion website and we can see films on internet through the pc or TV emissions. 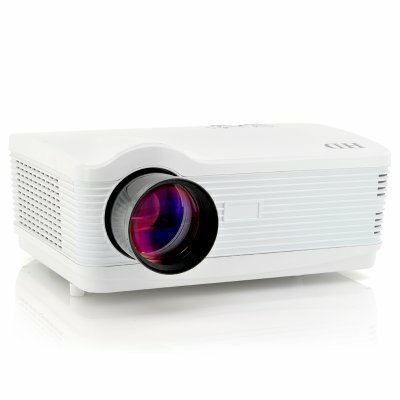 If you decide to use the projector to surf on the internet, and see films, you will have to install also an AV cable in order to get sound from the projector to the receiver. The brightness is OK. I wouldn’t see a film with the room lights on, but when we put TV emissions and want to do something else with the TV working, there is no problem to see the picture. This id a good projector for this price. I tried to surf the internet with the Android software provided with the projector, but it is not very comfortable as windows 7 on the PC. Maybe it is possible to install Windows on the projector. I don’t know how to do it.The resolution of the projector is not very good and it cannot replace a real screen (or TV) for working with the computer, but it is enough for a movie or TV emissions.